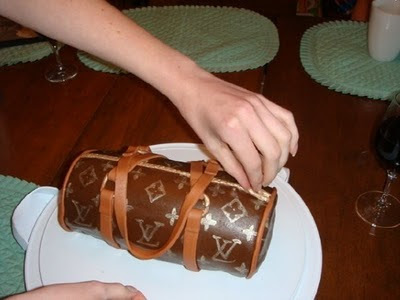 A couple of summers ago, my brother's girlfriend's birthday was approaching, and somehow I got the idea in my head that I was going to make her a cake that looked like a Louis Vuitton purse. I was pretty fresh into baking at this point (maybe 6 months?) so the idea was pretty ridiculous. I don't think I even knew what gumpaste was, although now it's hard to know if there was ever a time. The cake itself was vanilla, with a layer of maple buttercream. Admittedly, the flavour combo was pretty amazing, even sans chocolate (I know-- blasphemous, right?). There were lots of swears, but in a few hours the cake really took shape. I was literally brushing on the gold monogram logo minutes before she walked in the door and saw it. 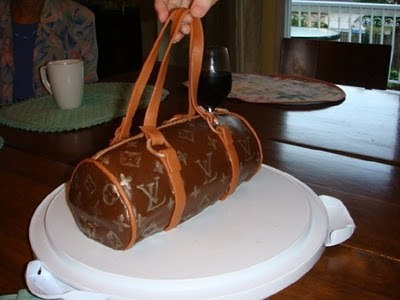 And thus was born Tamara's LV purse cake! But the bottom line? The next person who gets this cake better like chocolate.